NEW YORK (CNNfn) - America Online and Time Warner consummated their multibillion-dollar merger Thursday after the Federal Communications Commission gave it conditional approval -- clearing the way to combine their vast print, television, movie and Internet holdings into the world's largest media company. The decision, more than a year after the deal was announced, represented the final hurdle to creating a company with more than $34 billion in annual revenues and a wealth of brand name properties such as Time Magazine, Warner Brothers film studio, CNN and the AOL Internet service. All five FCC commissioners granted approval although conditions were imposed regarding open Internet access, instant messaging and the divestiture of AT&T's stake in Time Warner Entertainment. Two commissioners dissented on any conditions being attached to the merger. FCC Chairman William Kennard said because of the size and scope of the two companies involved, the commission "balanced the need to protect the public against the danger that any one company would become so big and so dominant, against our concern that we not intervene in an overly regulatory way in the marketplace." Company officials said in a statement Thursday that the merger had been completed. The new company, AOL-Time Warner Inc., will be traded under the symbol AOL on the New York Stock Exchange. "We are very pleased with the FCC's favorable vote today on our merger," a Time Warner spokesman said. "This final regulatory approval represents a tremendous win for consumers and we are now in the process of completing the merger." Kennard, at a news conference announcing FCC approval, said the three conditions imposed on open access, instant messaging and AT&T's divestiture of Time Warner assets were aimed at protecting consumers. "These conditions are designed to protect the open competitive nature of the Internet," Kennard said. The first ensures open access to AOL's high-speed Internet cable lines to rival Internet service providers, and requires that AOL allow unaffiliated ISPs to control the first pop-up screen. Second, the FCC is also requiring that AOL Time Warner open up the instant messaging platform to at least three competitors and make it interoperable with competing messaging services. Lastly, regulators are also calling for AT&T �(T: Research, Estimates) to divest its stake in Time Warner Entertainment. The FCC declined to place conditions on the development of interactive television by AOL Time Warner, but will instead hold a broad inquiry into the emerging technology. Steve Case, now chairman of AOL Time Warner, said the merger will help the company "lead the convergence of the media, entertainment, communications and Internet industries." "This is a historic moment for consumers everywhere, and a tremendous step toward our goal of becoming the world's most respected and valued company," he added. AOL Time Warner CEO Jerry Levin said the merger will be good for consumers. "Our unprecedented range of businesses will enable AOL Time Warner to launch new platforms for growth and to empower consumers in new and exciting ways," he said in a statement released after the FCC approval was announced. "We are hitting the ground running with a clear road map for creating value for our customers, business partners, shareholders and employees," he added. Kennard said the merger could foster competition. "When I look at this merger, there are some clear potential benefits:� I see the ability to roll out technologies faster, and further. This is clearly a merger of convergence, and that provides some possibilities for exciting new technologies and innovation," he said.� "But those benefits could be the proverbial silver lining." Last month, the Federal Trade Commission approved the merger after the companies agreed to a series of unprecedented concessions aimed at protecting competition in the high-speed Internet access market. When the deal was originally announced on Jan. 10, 2000, it was worth $164 billion, excluding debt and options. However, with AOL (AOL: Research, Estimates) shares currently trading around $47 apiece, the value of the deal has declined to about $111 billion including debt. Time Warner (TWX: Research, Estimates) is the parent company of CNN and CNNfn. 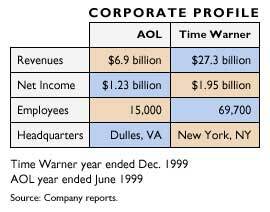 Time Warner shareholders will receive 1.5 shares of AOL Time Warner for each share of Time Warner stock they own. America Online shareholders will receive one share of AOL Time Warner stock for each share of America Online stock they own. AOL provides Internet service to 50 percent of all subscribers in the United States, and Time Warner has 20 percent of all cable television subscribers. 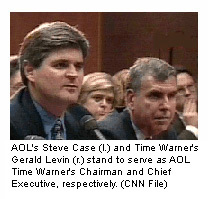 AOL currently has nearly 29 million subscribers -- 26 million AOL customers and 2.8 million CompuServe customers. The company's two instant messaging services, AOL Instant Messenger and ICQ, have more than 140 million registered users, easily surpassing rival services offered by Microsoft and Yahoo!. Approval of the deal was delayed because FCC officials continued to wrangle over placing conditions on AOL's instant messaging service. Prior to the Thursday press conference, CNNfn had learned that two of the FCC's five commissioners, Republicans Michael Powell and Harold Furchtgott-Roth, submitted votes to approve the transaction without restrictions. "Fascinating though the issues are, and as serious as they are, I believe the Majority has given in too much to their collective imaginations, rather than sound reasoning based on the record, in reaching some of the conditions on the merger," Powell said in a statement. The FCC has focused on instant messaging because the technology is expected to blossom from a fast way to send short notes to a platform for sending large amounts of data, such as video and music files. AOL rivals Yahoo! (YHOO: Research, Estimates), Microsoft (MSFT: Research, Estimates) and others also offer instant message services. Among the panel's three Democrats, Kennard supported approving the transaction, but was pushing for placing limited conditions on AOL's (AOL: Research, Estimates) instant messaging, the free Internet chat system dominated by Dulles, Va.-based AOL, according to a source. Democrat Gloria Tristani, who had been arguing for instant messaging conditions for weeks, had tentatively voted against approving the merger, believing that the limited conditions Kennard supports don't go far enough, but then changed her mind. "Though I advocated for even more forceful conditions, the strengths and conditions go a long way to protect consumers," Tristani said at the press conference. "In the end, voting in favor of the decision serves consumers better than lodging a dissent."